Lamps and chairs. We always have a surplus of lamps and chairs in the office because there are so many goods ones out there. It’s two of the easiest categories to fulfill in an interior. Somehow they embody all aspects of great design---functionality, ergonomics, style, quality and creativity all in something you can hold in two hands and even, possibly, afford. You may have to put your Shigeru Ban house on the back burner until the economy upswings but you can have an equally evolved design in a great lamp or chair. Below are ten lamps that look particularly relevant these days. “Patrocio” table lamp by Gae Aulenti. You will have to hunt (and pay) for this one but so strange and bizarre. 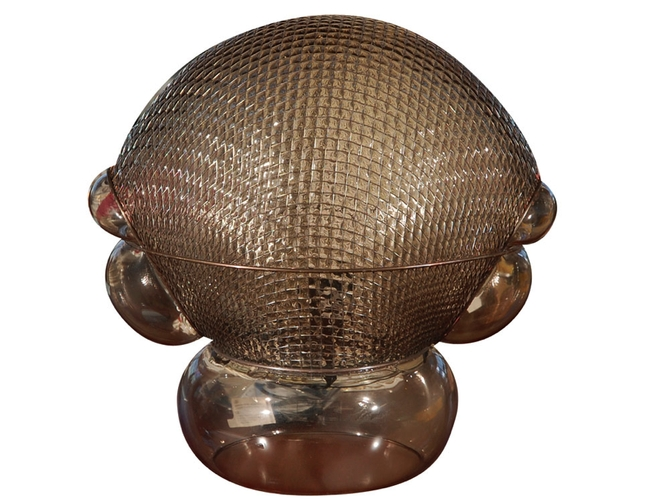 I think there were three versions of the great architect’s line of these rare lamps. Blown glass around a wire mesh referenced old world country style with some sort of futuristic dystopia. It projects amazing patterns of light. “Tab” lamps by Barber Osgerby. A simple and very pleasing new design inspired by classic tent lamps by the always-worth-watching British design duo. Available as floor or table lamps. “Daphine Terra” by Tommaso Cimini. So visually light and spindly as to almost disappear in a room. But the double articulated arm, minimal stylings, variable wattage and 360-degree movement make this one of the chicest and most versatile floor lamps ever. The classic 1932 task lamp. Still absolutely perfect and timeless. More sculpture than efficient, but what a beauty. Carved out of one piece of white marble and with a high price tag. Just let it sit there and glow and be admired and caressed. “Grasshopper” floor lamp by Greta Grossman. A finally-getting-her-due, California-based female Mid-Century designer and architect. Perfectly balanced and functional and very evocative of the Case Study house time. Its current availability and affordability is a real cause for celebration. The always-astounding Achille Castiglioni’s classic high tech masterpiece. The exposed auto headlamp is artfully cradled on an adjustable arm with an exposed transformer. As reductive, inspiring and sculptural as it gets. The icon designed by Richard Sapper. A victim of its own overexposed success, it’s time to reconsider it as it looks particularly great again in that 80s high tech Halston, Joe D’Urso way. Hand thrown and individually glazed with various patterns and colors, these ceramic table lamps are still relatively affordable even on online auction sites. A great example of California organic modernism craft at its best. “Atollo” lamp by Vico Magistretti. Predicting the post modern trend to come, this 1977 designed, perfectly balanced favorite is still best in the original black or white glossy metal version.